1. 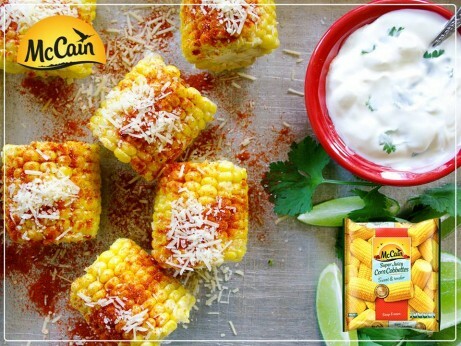 Cook McCain Super Juicy Corn Cobbettes according to packet instructions. 2. In a small bowl combine yoghurt and coriander leaves, set aside. 3. Combine sweet paprika and Parmesan in a bowl, rub each cobbette with butter, and sprinkle with paprika and Parmesan mixture. 4. Place cobbettes onto a serving plate, season with salt and pepper, and top with any remaining paprika and Parmesan mixture. Scatter plate with lime wedges and remaining coriander sprigs. Serve with coriander yoghurt. 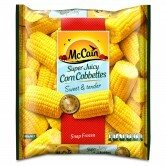 1 Cook McCain Super Juicy Corn Cobbettes according to packet instructions. 2 In a small bowl combine yoghurt and coriander leaves, set aside. 3 Combine sweet paprika and Parmesan in a bowl, rub each cobbette with butter, and sprinkle with paprika and Parmesan mixture. 4 Place cobbettes onto a serving plate, season with salt and pepper, and top with any remaining paprika and Parmesan mixture. Scatter plate with lime wedges and remaining coriander sprigs. Serve with coriander yoghurt.